New Document: Centro Español de Tampa, Bodas de Oro, 1941. 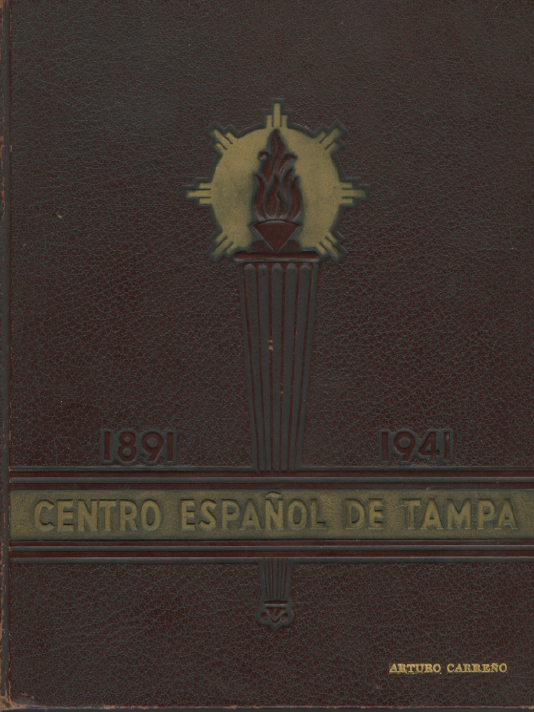 An invaluable resource, this book tells the history of Tampa’s first Spanish Club from the vantage point of the organization’s fiftieth anniversary in 1941. The large scanned document (100 megas) is in Spanish; it is a gold mine of information and images, and can be downloaded here: Centro español de Tampa: Bodas de Oro. This is an experiment, so please leave a comment letting us know how the download goes, and what you think of this document. This entry was posted in Florida and tagged Anthony Carreño, Bodas de oro, Centro Español, Florida, Tampa. Bookmark the permalink. 8 Responses to New Document: Centro Español de Tampa, Bodas de Oro, 1941. Considering the large file size of the download, it went rather quickly. I briefly looked at some pages and was very impressed with the amount of supporting information provided by each officer within the social club. A file so comprehensive deserves to be studied when time permits. The download was easy. I will look at this in the morning. Download was easy. I will look at it in the morning. No problem downloading and, considering the file size, quite fast. I skimmed the entire document, and everything is quite legible. Es un documento excepcional, por su meticulosidad. Solo he localizado siete apellidos vascos. I am so glad that I learned to speak, read and write Spanish. This site is incredible. Thank you so much! It was such a joy to see the name Manuel Guisande among the list of voluntary donors for the construction of the FIRST building! I found two other Guisandes (Miguel Guisande Casal & Jose Guisande Casal) on the page containing the original members. The name Guisande is very rare and seldom seen ANYWHERE. Now I am interested to find out how we are related! Beautiful document and easy to download and read!